In the interest of full disclosure, I must say that the three people involved in this book - Lisa, Carol, and Laura - are friends of mine (Lisa taught me to knit, as a matter of fact). They are great, funny, smart women, who happen to be amazing knitters and designers as well. So maybe I am prejudiced. Though not necessarily. You see, I would be likely to buy their book no matter what, since I know and like each of them. BUT - about two weeks ago, I stopped at Rosie's for something, and Lisa had her advance copy sitting on one of the tables. So I browsed through it while I was there, and I can truthfully say that even if I never had known that the three people involved had ever existed, I would be buying the book. The designs are both interesting and modern-looking; there are different types of things, not only sweaters, or scarves, etc. ; Interweave Press has made it a visually appealing book; the designs are ones that will not look weird or dated in five years or more, so though modern interpretations, they are classic ideas; and, I think the patterns will appeal to a broad range of knitters. At this time, I don't know if there will be any parties or book signings in the Philadelphia area or anyplace to celebrate the book's publication, but whether or not there are, get thee to a book/yarn store, and treat yourself to a copy! I really think you'll be happy with it. I found out over the weekend that the Yarn Harlot will be at the Philadelphia Book Fair on Sunday, May 18! How cool is that? Sadly, I have already made a commitment to volunteer at another event on that day that doesn't end until 12 noon, right when her program begins. So I may not have the chance to see her, which is disappointing. I was mentioning this to a knitting acquaintance, and she nearly had a coronary that I was not going to drop everything to go - "How can you put anything else ahead of such an opportunity?? Are you crazy??" Oh, except I wasn't, was I? No matter, I saw a link in Paper Cuts to Pepys diary, now online. Take a look, it's really interesting. I don't know as much about Pepys as I probably should, but it is somehow reassuring to know that on April 29, 1665, he was hoping to get a better night's sleep, since he had "committed forty blotts and blurrs in my letter..." Some things never change, do they? Isn't this a great picture? On the back someone wrote "Harry 4 months," which means the picture was taken in December 1916. The funniest thing is, this is a perfect depiction of my father - hardly any hair, posed like he's at a bar, waiting for his drink! When I was a little girl, and first saw this photo, the thing that struck me was that it was my dad, wearing a dress!! Later, of course, I saw other photos of him, taking part in "hilarious" shows for organizations where he was a member, dressed up like a woman (not nearly as upsetting as the pictures where he is in blackface for a minstrel show ... oy with the poodles already!) - but this one was amazing to me, as until I saw this, I had no ideas that little boys *ever* wore dresses, at any time in the universe, for any reason! Of course, since he was my dad, I thought he was great. But pictures of him as a young man didn't look like anyone I knew, as I remember him when he was heavy set, with a crewcut and dark glasses (a la Drew Carey on his original TV show). This picture to me looks just like him, and it amuses me greatly to boot. I have it framed with other family photos on display when you come in our front door. The Dad that I remember was really funny, lots of fun (much more than my mom, who was stuck with us 99% of the time), and a really good cook. I also realize that he was prejudiced, though we were not allowed to be. That has always intrigued me - the fact that he couldn't change his feelings, but knew he didn't want us to be that way. During World War II, he was in the Army, and he always said his major contribution to the war effort was his excellent vocal skills as the singer for the base band - it was years before I realized that he was laughing at himself when he would say this (as I was always sure he meant he went on tour with Bob Hope in the USO shows ...). I also remember a story about my sister Mary Ellen coming home from school one day crying, because someone had laughed at my father's name. We had a last name that is also a first name, so when the teacher asked Mary Ellen what her father's name was, and she said "Harry ______," they thought she meant "hairy" as a descriptive term. Then there was the time that we decided that we would spend the day speaking to one another using only Gregorian chant. My father called home, and Mary Ellen answered, chanting, "Hello this is the ______ residence," at which point he asked to speak to my mother. The first thing he said to her was "What is in the hell is going on there??" Which of course made us think it was even *more* hilarious! My dad died when I was 13 years old, from liver cancer. I think of him nearly every day, and thought of him especially when I was going through all of my tests for cancer, and the resulting surgeries. But mostly I remember him, sitting at a bar, waiting for his drink, pretty much like he is in this picture. Or taking me - just me - to the circus every summer. Or our many trips to the shore, filled with adventure, because he didn't believe in making hotel reservations. And so many other little things, it seems that he has always been around. Love you, Dad. I hope if there is a heaven, that you are there. And that it's lots of fun. And I hope that everyone who could, voted - even if y0u voted differently than I did! What, you may well ask, was the occasion? Well, I was involved in the Favorite Color Swap 3, and this was my box o' goodies! I had received some fun comments from "The Knitting Fanatic," and I couldn't wait to see who would be sending the package. 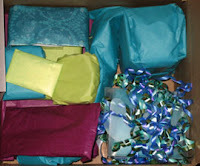 When I opened the box, I couldn't believe that she had even wrapped everything in my three favorite colors - green, blue, and purple - talk about paying attention! OK, not the best picture, but she sent me The Story of Chicago May, by Nuala O'Faolain, which I have wanted to read since it came out; note cards; Lantern Moon Sox Stix (I'm too cheap to even think of buying these for myself, though I visit them often at Rosie's); a large tin of African Autumn tea (which she said is particularly good iced); a small tin of Winter White Earl Grey tea; felted ball stitch markers; a tape measure with a lizard* on it, and the part you pull out to measure is his tongue; a stitch keeper, which I never saw before, but it is like a combination of a Chibi needle and a teeny crochet hook, on a ring similar to a keychain ring; and, the yarn - oh the yarn!! Two skeins of Noro Daria (a cotton/rayon blend), in greens, blues, and purples. It is so pretty, and when I saw it, I immediately thought it would make a good bag of some kind, so I'm going to poke around to see what patterns are out there. I had the best time opening all of these packages, and then going through and seeing them again. Thanks so much, Allegra! I am so happy with my package, and am touched by your efforts to choose things that I think are just perfect. It was a wonderful way to head into the weekend. Anyway, thanks for stopping by, commenting, whatever. I hope you'll stick around. Gee, this has never happened to me - HA! Most of the time, I try to continue reading to see if I can figure out the meaning of the word or phrase in the context of the story. If it is something that I can't fit in anywhere, I'll generally look it up. To be honest, most of the time I'm too lazy, so I "decide" what it means and move on. The second one is really stupid when you get down to it. I would come across dialogue where one person would use the contraction "c'mon." A lot of the time I realized what it was/what it meant, but occasionally I couldn't remember, and would think it was short for "See you on Monday." Needless to say, I would be really annoyed when one character would be talking to another one and say something (I thought) like "See you on Monday, let's go to the park." I would think to myself *what* are they trying to say??? How dumb! Though even writing it at this moment makes me laugh at myself, so that's a good thing. I am so pleased with how well it turned out, and how even my somewhat lame sewing skills managed to place and secure the applique pieces so that it actually looks balanced. Personally, I think it looks yar! 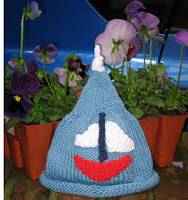 Pattern: Sailboat, from Itty-Bitty Hats, by Susan B. Anderson. Finished: The pieces were all knitted by March 30; I sewed the knitted applique pieces onto the finished hat on April 6. I think that Ben and Halden will really like it. 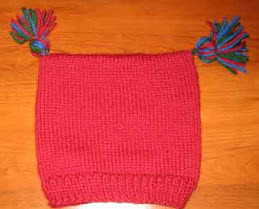 (Doughboy will like it if I show it to him while also holding a treat ...) And hopefully, they'll give us a picture of the baby wearing it. If so, you know I'll post it here. In other news, look what Brigitte sent to me! This is adorable! It even includes Timmy (the littlest sheep), which I may just have to make for The Tim. (I never doubted that someone with such a lovelly name, who also has cats, would be nice - but this is extra nice ...) Thank you so much, Brigitte! Me: A baby hat for my next-door neighbors. Co-worker: Did you make it for their baby? Me (in my brain): No, I just give out random baby hats to see what people will do. Me (in reality): Well ... yes, for their baby who is due at the end of June. Co-worker: Will it last until then? Me: If I cover it with a dark cloth, and put it under the magnolia tree in our garden. See you at the next Mensa meeting! I have a pretty decent collection of these books, though I haven't seen any for a while. I was cruising around on some book blogs, and came across a link to this article, which I thought was really interesting. I only knew bits and pieces about how it all got started, and what had changed along the way, so it was nice to learn the whole story. Like any publisher's offerings, some are more interesting to me than others, but after reading this, I'm glad I have as many as I do. And most of them were bought second-hand, but in excellent condition, for one or two dollars at a used book store near where we lived in Chicago. Even better, as far as I'm concerned. I read two books, and otherwise caught up on some magazines for the month of March. Overall, quite a successful enterprise. My book of the month for the Book Awards Reading Challenge was, coincidentally enough, March, by Geraldine Brooks. (This book won the Pulitzer Prize in 2006.) I chose this book for two reasons: 1. I was curious to see if it worked, and 2. I've read good things about Brooks' writing, and, since my mother's name was Geraldine, figured I should give her a try. March is the story of Mr. March - the father who is absent for most of the book Little Women. I will admit to being extremely skeptical of this choice - as I told a friend, I really don't like people messing with my classics! And to be honest, I didn't really spend too much time worrying about Mr. March when I read Little Women, though his daughters and wife spent a lot of the book being concerned, and missing him. I was very pleasantly surprised at how much I enjoyed the book. Geraldine Brooks very clearly made sure to pay attention to the details of the original story, and to be sure that it was told in a proper historical context. Mr. March is, from what I have read otherwise, also based on Bronson Alcott, who has always fascinated me. The story takes us through Mr. March's life, from his time as a young man, traveling through the south selling household goods, to his meeting and eventual marriage to Marmee, to his experiences as a chaplain in the Civil War. The story manages to be complex without being confusing, and I found Mr. March to be pretty interesting, both as an individual, and in his observations about people he knows, including Thoreau and Emerson. Brooks has an excellent descriptive style, so that it is not hard to imagine the places Mr. March visits, even if you have never been there. I'm glad that I read this book, since it was a complement to Little Women, without being sentimental or too intrusive on the story of the March girls. I would recommend it to anyone interested in seeing what someone could do with the slightest information about a character in the original story. Next up was Laced by Carol Higgins Clark. I was at the library, and looking for something that I thought would be an entertaining, quick read. I saw this book, and though I have never read any of her titles, I have read a lot of her mother, Mary Higgins Clark. The story was about an antique lace tablecloth that goes missing during the main character's honeymoon in Ireland. So, we have: lace, Ireland, mystery - all things I like. What the heck, I gave it a try. It was in fact, an entertaining and quick read. The depictions of the people encountered in Ireland, and the places visited by the couple trying to solve the mystery was really enjoyable, reminding me of certain things and locations that I remember from my trip there a few years ago. The mystery was mystery enough, not requiring a lot of tracking of details, which was fine, since my brain was just not in the mood. When I find myself looking for something similar down the road, I may try another Carol Higgins Clark book. He is my constant companion when I'm home, and often "assists" me when I am writing posts, by sitting in front of the screen, and occasionally pawing the keyboard. 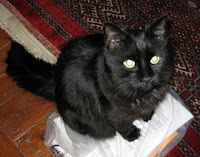 He joined the family a few years back, after being a stray who was living in our garden for a month or so. We referred to him as "Garden Kitty" to differentiate between him and the inside cats. 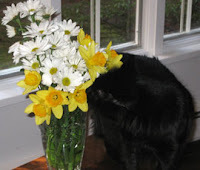 When Hurricane Floyd hit, we brought him inside, so he would be safe. He is a very good kitty, and a sweet boy, if very skittish. He never received a proper name, because we thought of too many good ones, and couldn't decide! His middle name is Ignatius, though, after St. Ignatius Loyola (this is what happens when you are the product of a Jesuit education). So even though Garden Kitty is, as The Tim says, "more of a title than a name," it's what he answers to, and it suits him now like no other name would. I'm sure the rest of it won't take that long to do, and I'm hoping to finish it completely by this weekend. The last couple of days, I have been working on other things, mainly because I'm in one of those moods where it is hard to focus on only one project for any length of time. Last year, I missed meeting up with Barb, but I did get to meet Ann and Liz, who I now think of as two of my favorite people (watch - they'll be going in disguise this year to avoid me ...). Well, who would have imagined, but I have made further advances into twentieth-century technology! I think I mentioned that I received an MP3 player from The Tim for Christmas. Because a) he likes gadgets, and b) he knows I'm slow on the technology uptake, he was kind enough to have quite a bit of stuff already downloaded so that I could enjoy it right away. This past weekend, I managed to download two episodes of Cast-On (all on my own - film at 11! ), and listened to one of them during Earth Hour on Saturday evening.